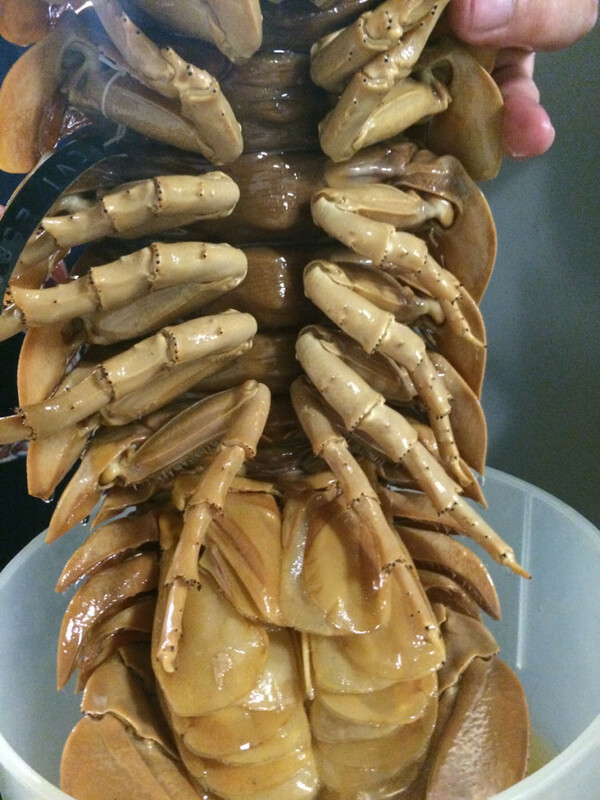 We all love a good science fiction creature. Well, here’s one that really exists! 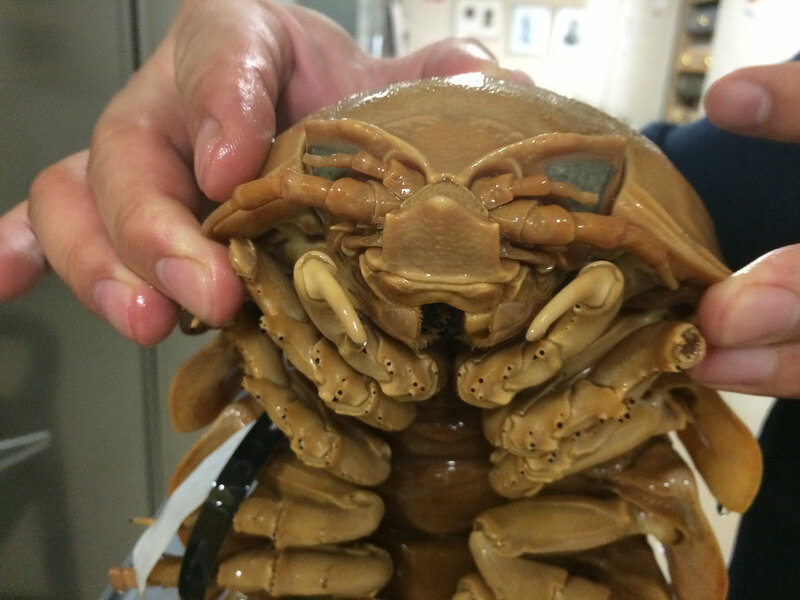 The amazing bathynomus is an isopod that begs for stories to be written about it! 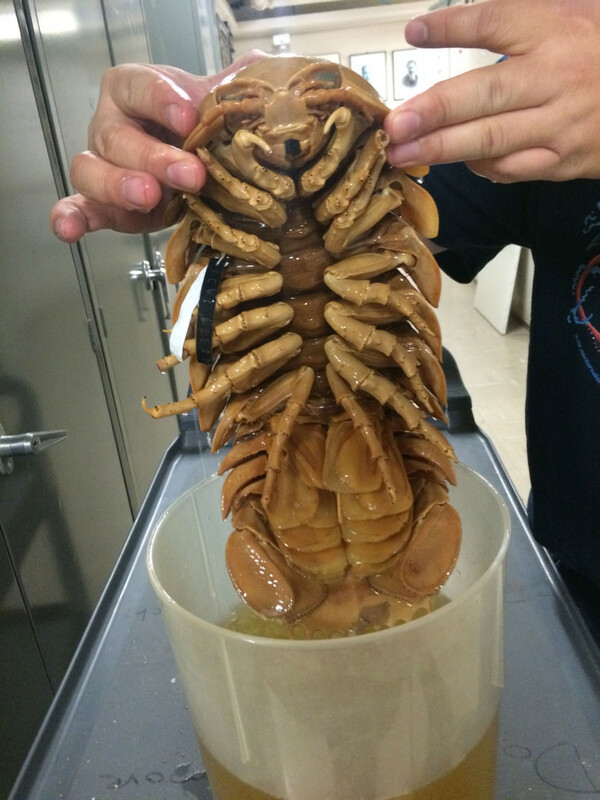 I saw this specimen with Chris Mah at the Smithsonian Museum of Natural History. 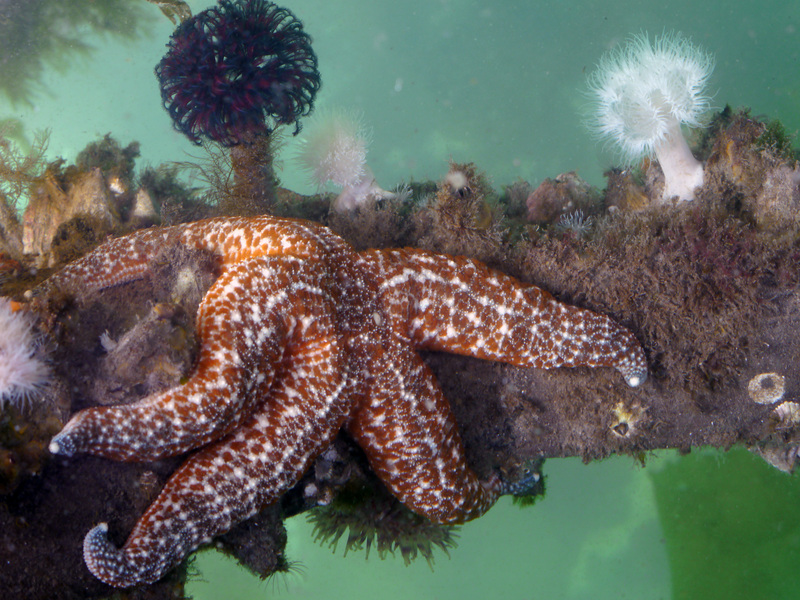 Learn more at Chris’s amazing blog: The Echinoblog. 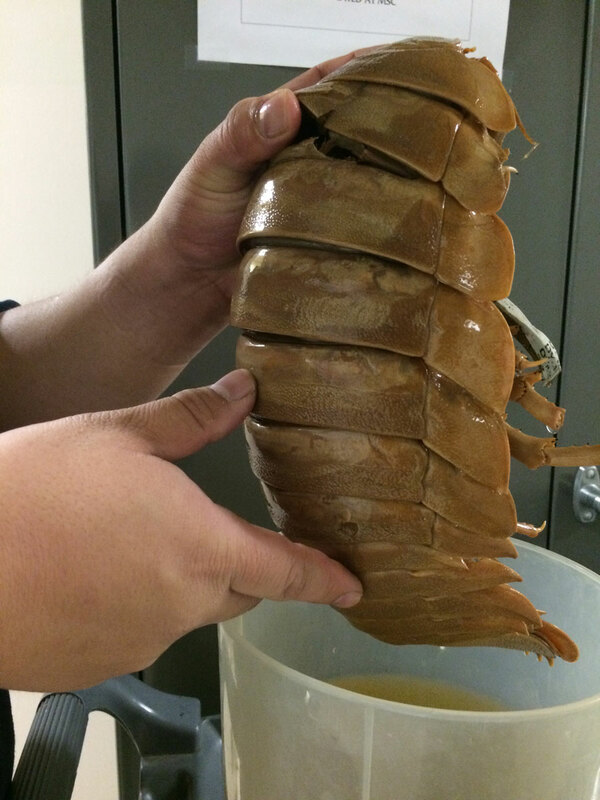 You can also read about this creature from Kevin Zelnio’s article, which is like “Bathynomus 101” – a great way to learn about these interesting deep sea creatures! 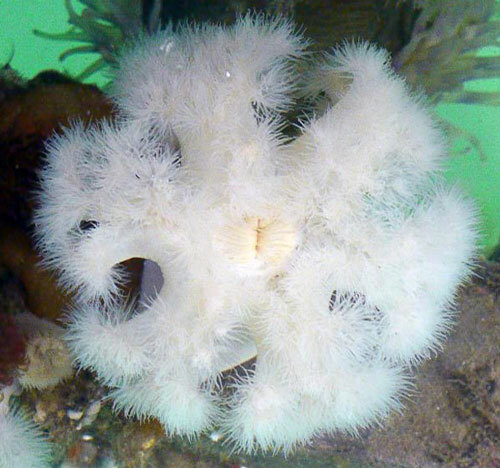 This entry was posted in Animals, Biology, Photographs and tagged bathynomus, echinoblog, smithsonian on September 30, 2014 by Karyn Traphagen. Yes, of course we saw amazing mountains and glaciers in Alaska. 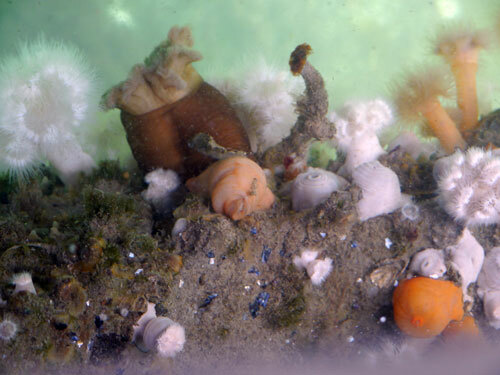 But some of the real treasures were found underwater in Tutka Bay. Take a look at some of these anemones, feather worms, sea stars, and other assorted beauties! These were all found under the dock of the lodge where we were staying. 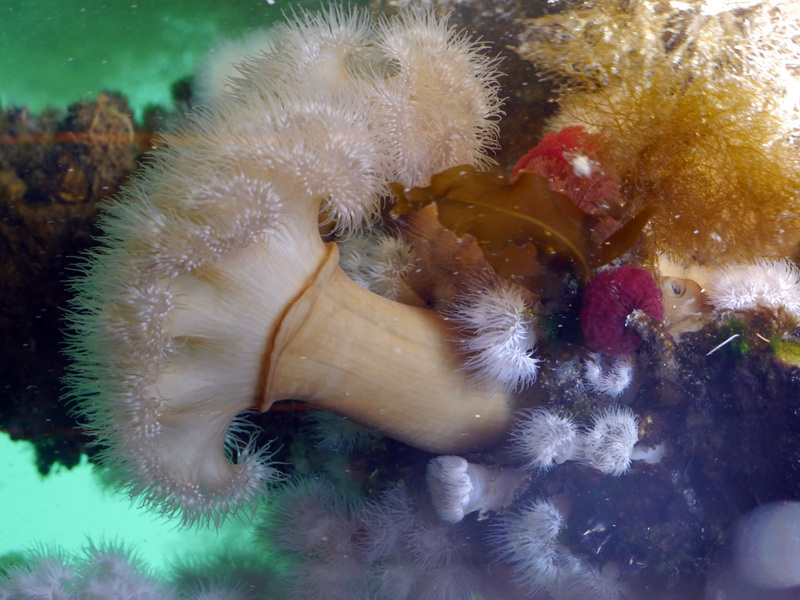 Although I also took some underwater photos, these were all taken above water, focusing through the cracks of the dock segments. 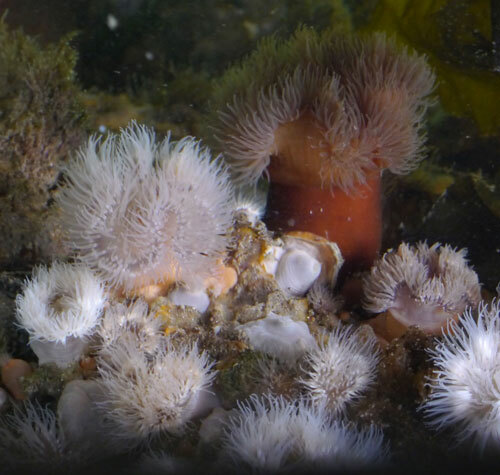 This entry was posted in Animals, Beauty, Photographs and tagged Alaska, Anemone, Anemones, Sea Star, Tutka Bay on June 20, 2013 by Karyn Traphagen. Day 5. Still mostly quiet and sleeping. Skin is darkening. 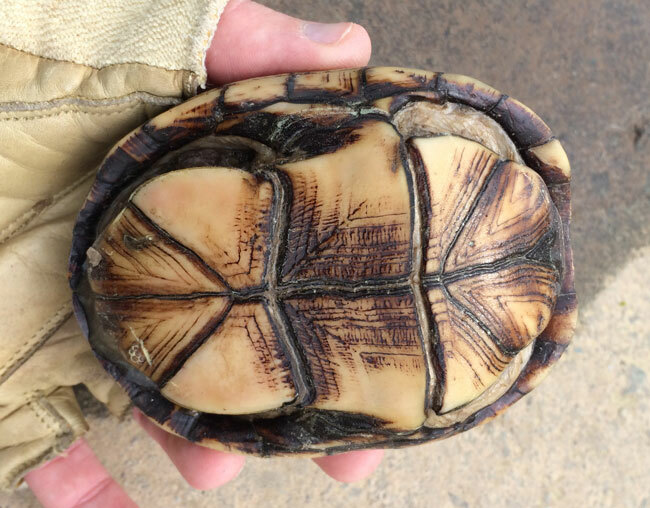 Feathers visible under the skin. Closeup #1 of those developing wings/feathers. 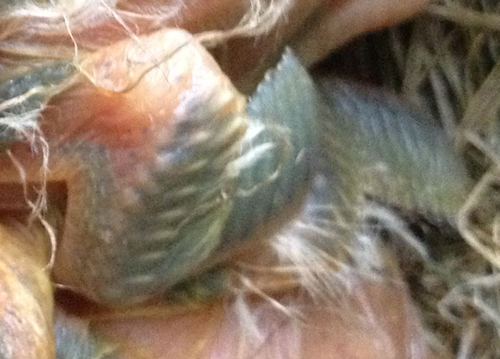 Closeup #2 of the wing/feather development. Those downy tufts on the top of their heads makes them look like old men! No, it’s not a buttonhole. It’s the eye slit widening. A few more days until they open. All lined up, waiting for food. 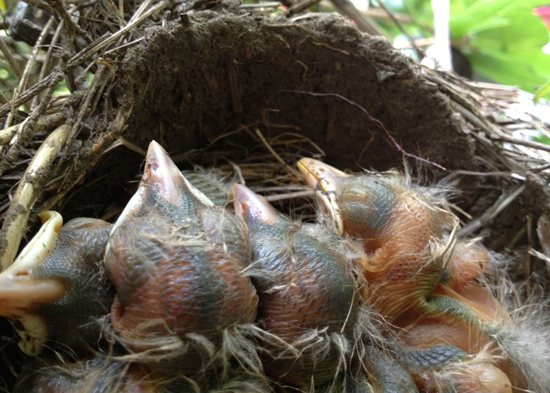 This entry was posted in Animals, iPhone, Photographs and tagged baby robins 2013 on May 3, 2013 by Karyn Traphagen. Day 4. More misty rain. Eye slits widening. 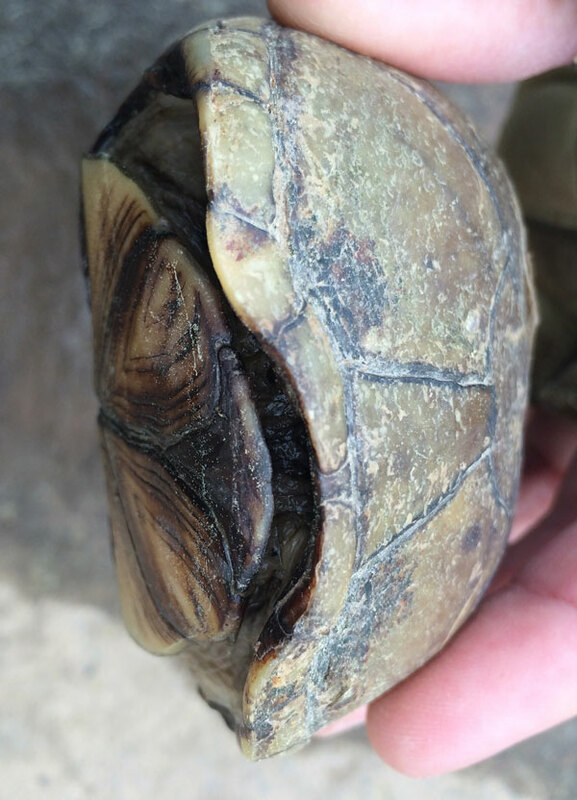 Wing feathers noticeable under the skin. Tiny robin feet! 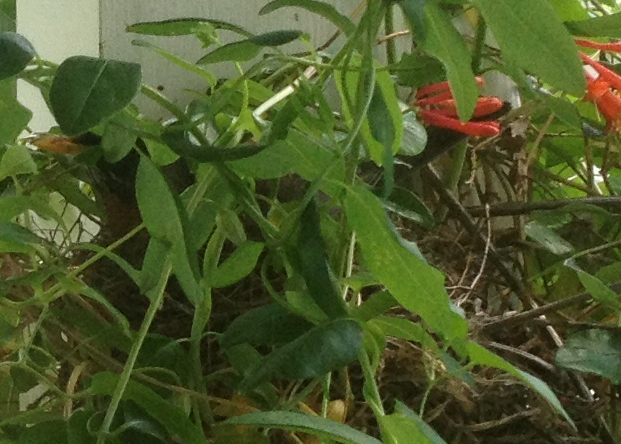 See if you can find the worm that the mother robin left in the nest for the babies to eat! 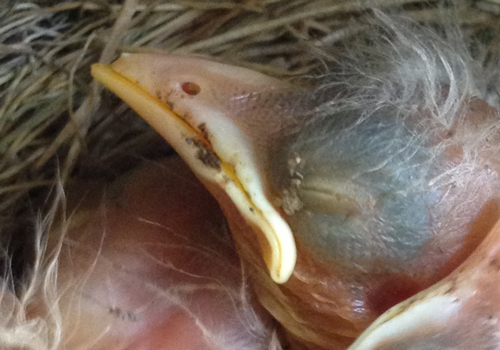 This entry was posted in Animals, iPhone, Photographs and tagged baby robins 2013 on May 2, 2013 by Karyn Traphagen. Day 3 and another chilly, damp day for the baby robins. The mother stayed on the nest most of the day. I checked them in the morning (sleepy heads) and at dusk (sort of hungry, but mostly sleepy). This group seems to be developing slower than last year’s. 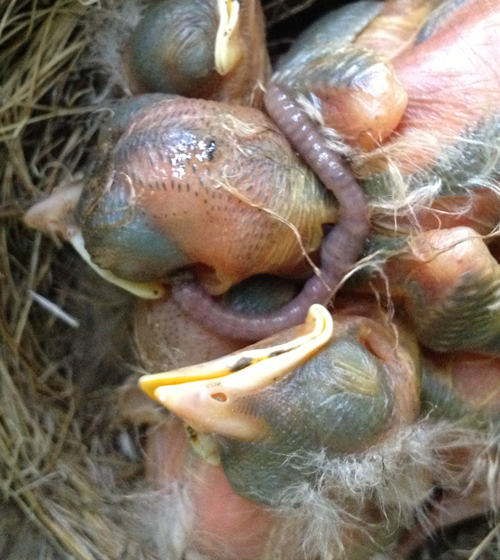 This entry was posted in Animals, iPhone, Photographs and tagged baby robins 2013 on May 1, 2013 by Karyn Traphagen. Day 2. 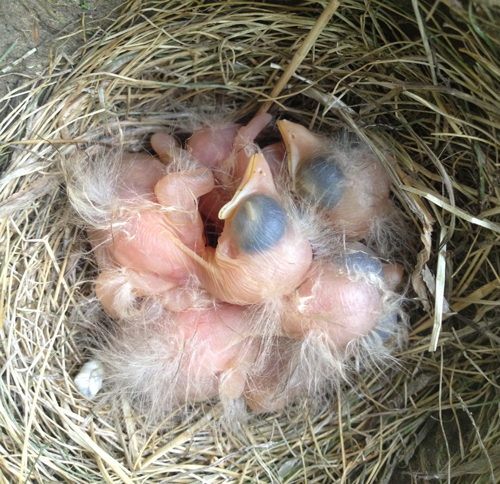 I was able to see all four baby robins, but they are really very snuggled together. Today was chilly and rainy. 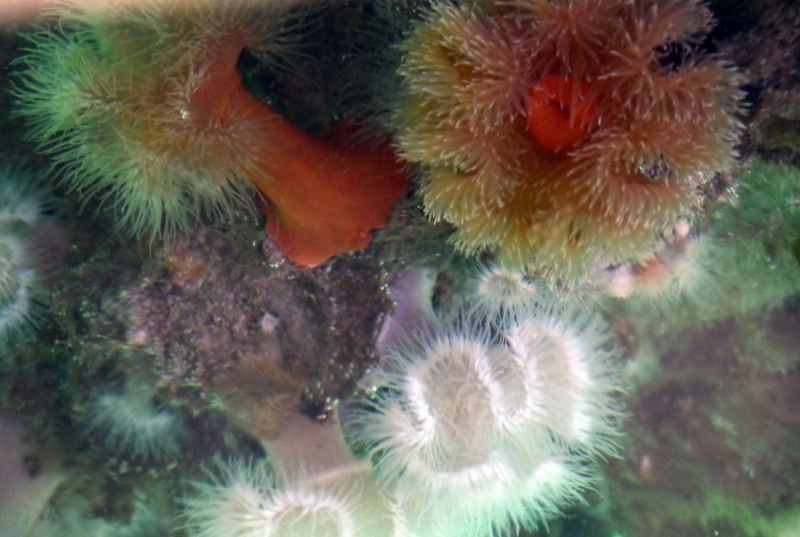 I expected to see them eating today, but mostly they slept. I try to only look in the nest in the morning and night so that they are not disturbed too much, but really, every time someone leaves the house, the mother flies to the nearby tree and leaves the nest for a few minutes. 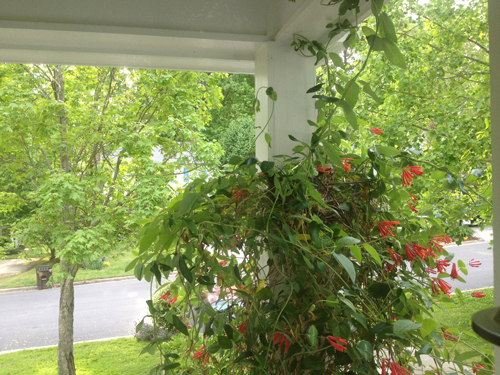 Here’s the honeysuckle vine on our front porch. Can you find the nest? 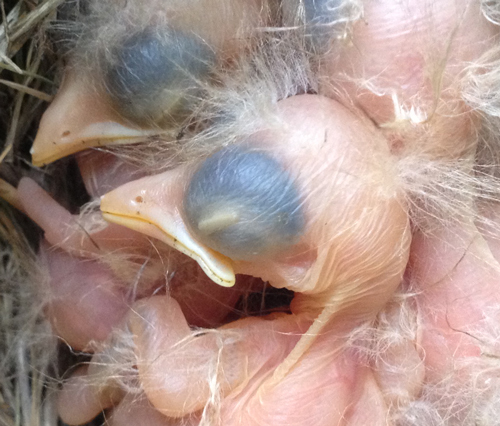 Look closely and you will see the mother bird’s beak. She’s done a terrific job keeping the warm and dry this weekend. Eye slits are starting to form. 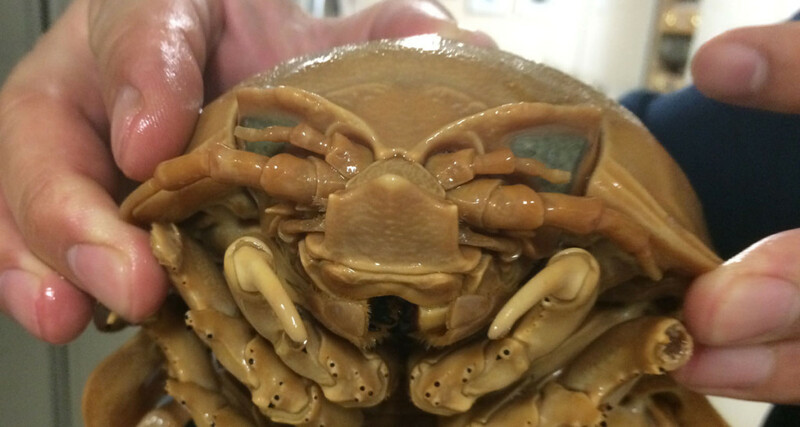 They will continue to spread across the eye before they are able to open. Four sleepyheads. Look at that baby chicken neck! 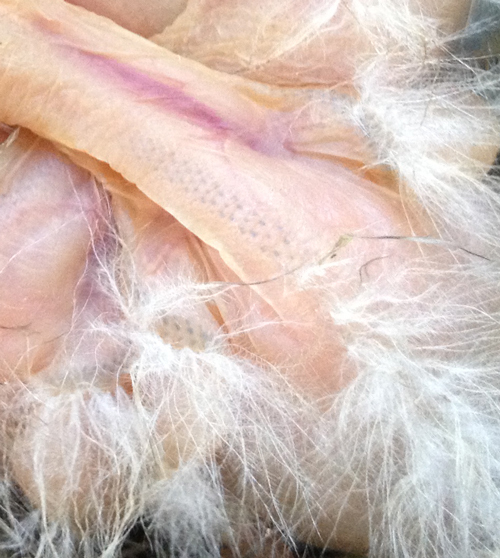 If you look close, you can see the beginnings of where the feathers will start to emerge. 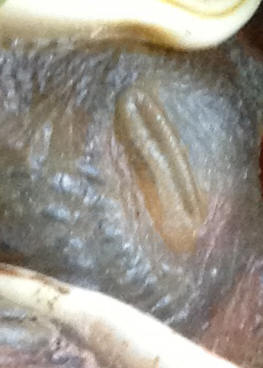 Not as sharp as I would like, but this closeup of the down shows off the tiny spurs that hold air. 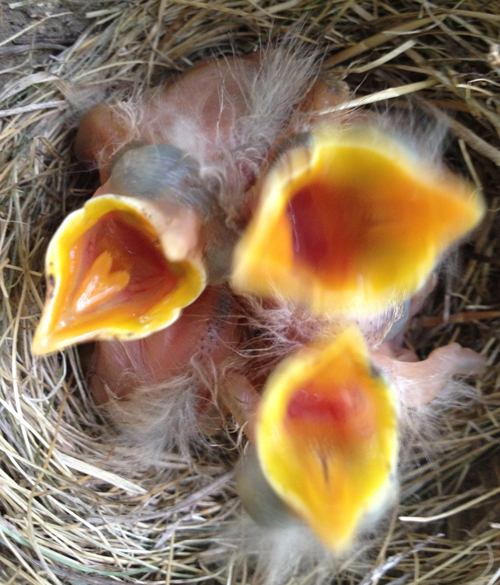 This entry was posted in Animals, iPhone and tagged baby robins 2013 on April 30, 2013 by Karyn Traphagen. We have baby robins again this year! 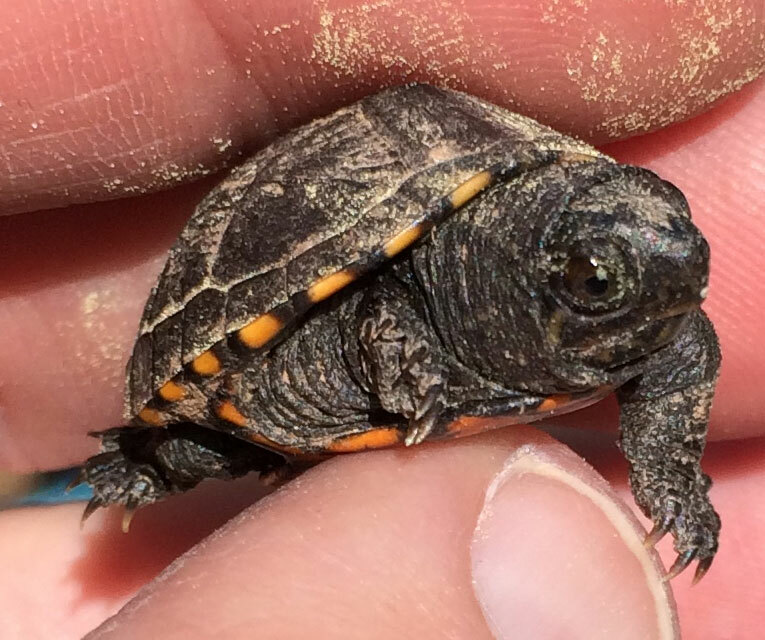 Last year I documented the 12 days of their development from hatching to leaving the nest. You can look through the archive here (reverse order of date, so scroll down to see the earlier images). 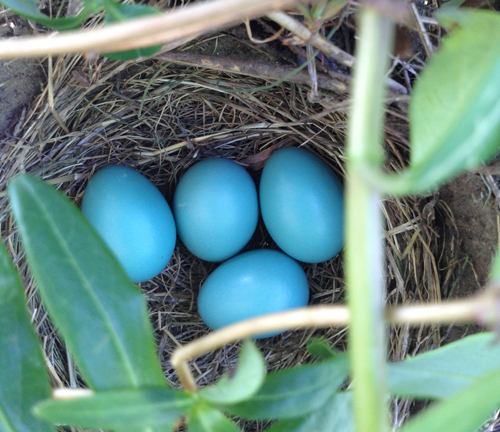 Four robin eggs in nest. The nest is built in our honeysuckle vines on our front porch. 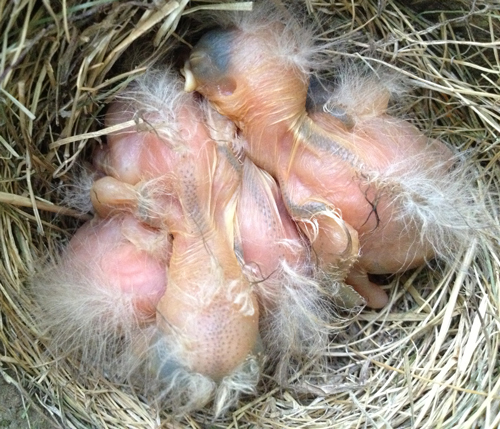 Baby robins Day 1! 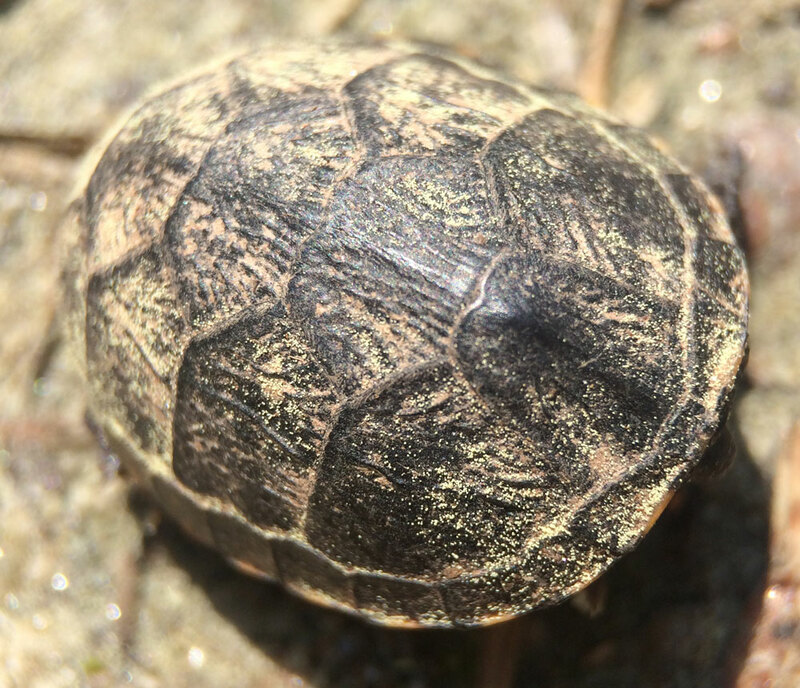 Hatched on Sunday, April 28th. 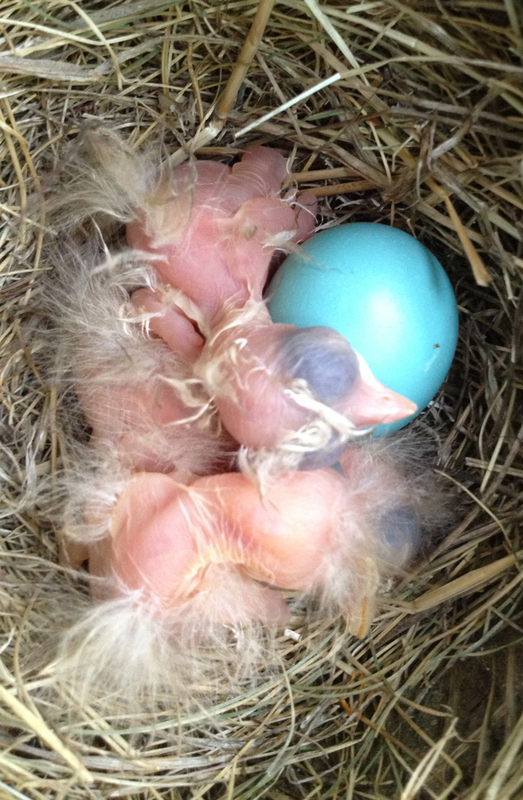 So far 3 of the 4 eggs have hatched. 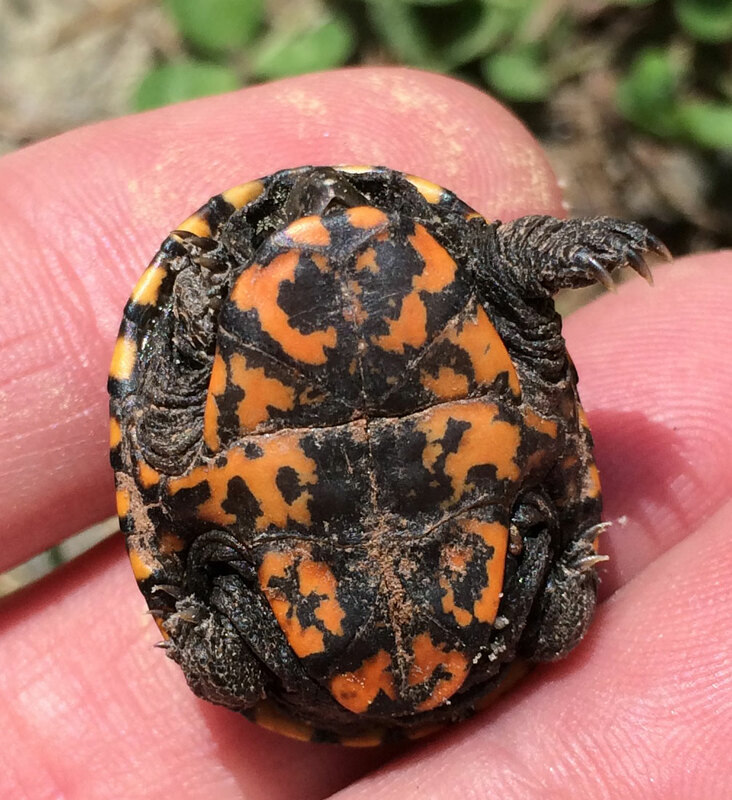 Last year they hatched on April 27th! 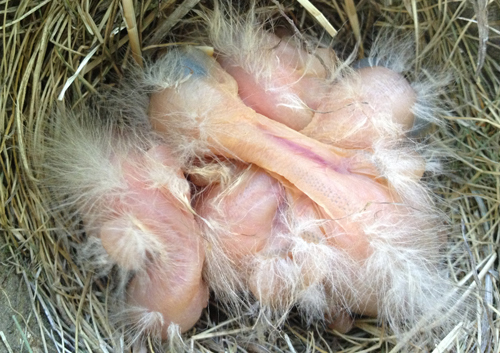 This entry was posted in Animals, Photographs and tagged baby robins 2013 on April 29, 2013 by Karyn Traphagen. Amazingly, the baby robins still make no noise in the nest. I am assuming this is so that they do not draw attention to their location. They are really filling up the nest now (and spilling over the edges!). Day 11: daily morning check of the nest. All four are still there! 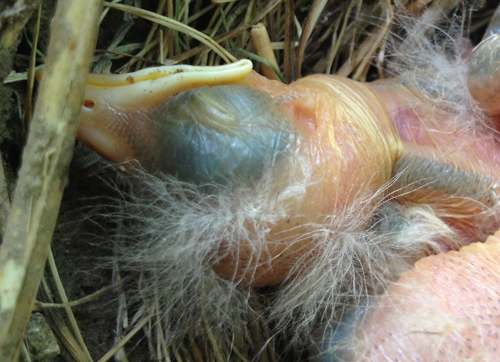 Day 11: As the feathers continue to emerge, the down looks more and more out of place! 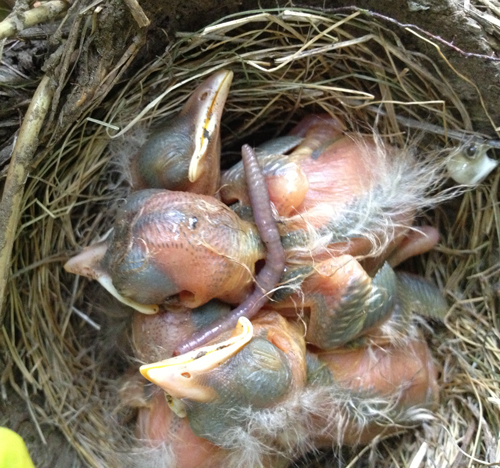 Baby Robins Day 12: morning nest check. They are sleepyheads! 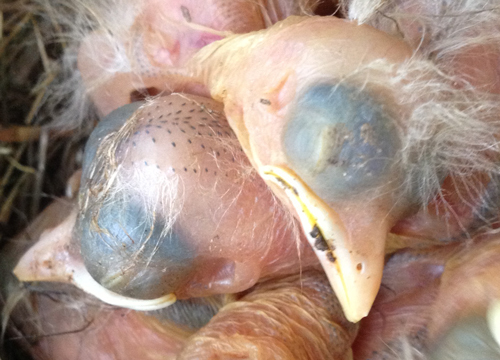 Baby Robin Day 12: Remember when that eye was just a tiny slit? Only a week ago! 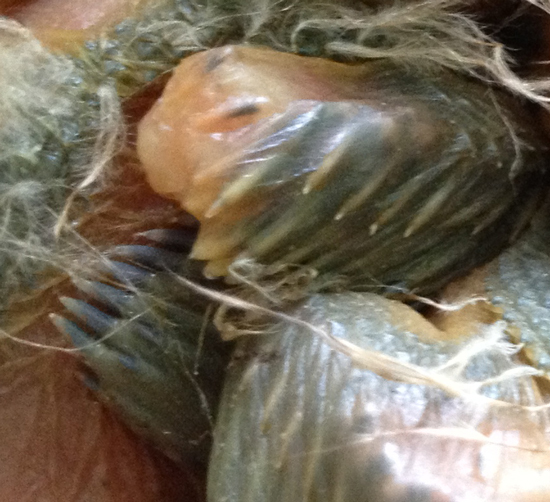 Baby Robin Day 12: head feathers are coming in replacing downy "mohawk"
Baby Robin Day 12: feathers are looking more and more like they will be ready for flight soon. 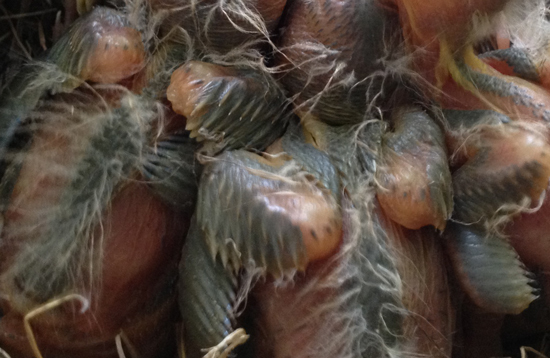 This entry was posted in Animals, Beauty, iPhone and tagged baby robin, down feathers, feather, nest, robin on May 9, 2012 by Karyn Traphagen. 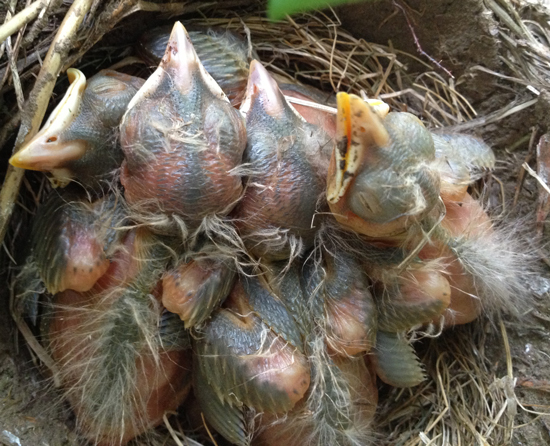 The highlight of the first weekend in May was Day 9 & 10 of Baby Robin development. The feathers are just amazing as they emerge. The nest is getting crowded! 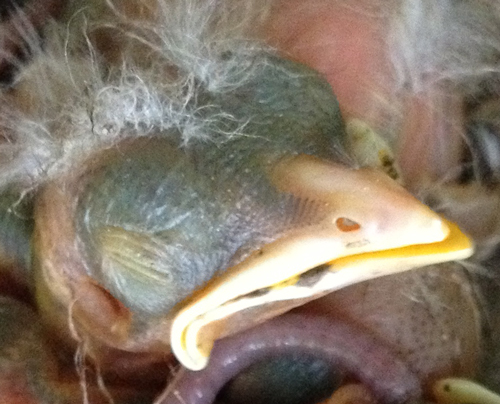 Check out that cute head and the feathers starting to emerge. The feathers on the wing look like a ruff around its little neck. Day 9: It's all about the feathers. 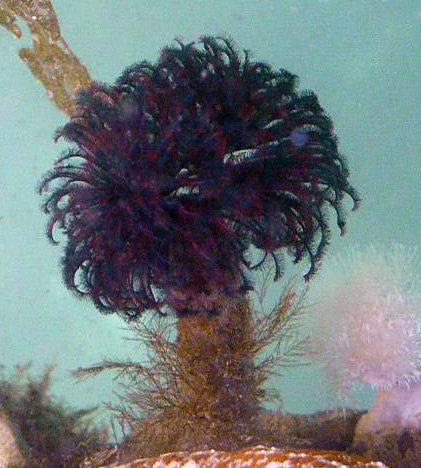 These look like paintbrushes to me. Day 9 feathers. Closeup of the Day 9 feather unveiling. 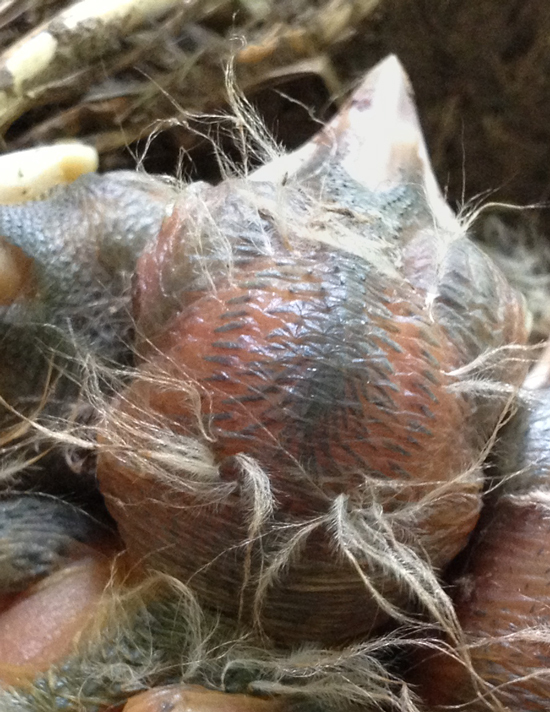 Day 10: Baby Robin sporting the mohawk look as down is replaced by feathers. 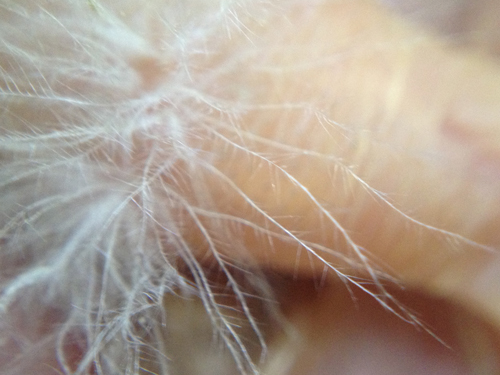 Day 10: closeup of feathers and down. 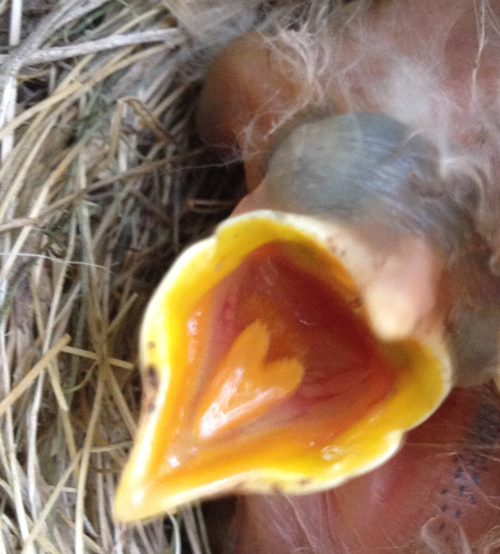 This entry was posted in Animals, Beauty, iPhone and tagged baby robins, down, feathers, nest, robin on May 8, 2012 by Karyn Traphagen.